I have watched Seahawks games for 22 years. I have been a season ticket holder for the last seven seasons. I have NEVER witnessed a more epic finish than what happened on Monday Night. I have dubbed the Seahawks victory over the Green Bay Packers the “Monday Night Miracle” after Golden Tate scored on a Hail Mary as time expired to give the Seahawks the lead and the win. I will get to my analysis, feelings, and opinion of Tate’s catch later on in this post. Other than this play, one of the greatest moments in Seahawks history, here are my thoughts about the rest of the game. Pass Rush: Present: In my preview posts, I always state that the pass rush is the biggest key on defense. If you can put pressure on the quarterback the chances of getting him to be uncomfortable throwing and/or forcing him to commit turnovers skyrockets. The Seahawks sacked Packers quarterback Aaron Rodgers 8 times in the first half; 4 by Chris Clemons, 2 from Bruce Irvin, and 2 from Brandon Mebane. It honestly got to the point where the performance of the Seahawks defense was laughable in the stands. It really was that amazing. In the second half the defense recorded no sacks, which is unfortunate. The next phase of improving the pass rush will be to display consistency throughout the entire game. Can you imagine if the Seahawks continued to sack Rodgers throughout the second half? It would have been the greatest defensive performance in team history. Shutting Them Down: The pass rush is only one part of the Seahawks defense’s night. The defense, which entered the game allowing only 13.5 points per game, held the explosive Green Bay offense to only 12 points. The Packers averaged 35 points per game last season. Considering the weapons Green Bay has, I am beyond satisfied with the defensive performance. The leading receiver for the Packers was tight end Jermichael Finley and he only had 60 yards receiving. The Seahawks now have the 4th best overall defense in the league. With another road test coming next, the Seahawks need to make sure that the defense keeps on rolling. If they can do that, they will prove to me and the 12th Man that they can be successful both at home and on the road. Another Average Night: Russell Wilson once again did not put up highly impressive numbers against the Packers. Wilson ended the night 10/21 for 130 yards and 2 touchdowns. Wilson did not even break triple digit yardage numbers until the final drive of the game. Once again however, Wilson committed no turnovers. In three games, Wilson has 4 touchdowns and only one interception. It is now to the point where I have to critique Wilson in terms of his stats. Throwing for only 130 yards cannot become the norm for Wilson. Russell must show improvement throwing the ball and completing passes. The defense is holding this team upright and they can only go so strong for so long. Sooner or later whether it is because of seasonal wear-and-tear, the defense will not be able to hold the fort down. It is up to Wilson to improve his numbers. If he can throw for at least 250 yards per game, I think the Seahawks have a great chance of winning the game. The Special Teams Is Exciting: It feels like every time the opponent lines up to punt or to kick a field goal, the Seahawks have a chance to block it. On Monday night, the Seahawks came incredibly close to blocking both a punt and a field goal. On the attempted field goal block, one Seahawk hurdled the Packers center and I was so convinced he was going to block it I jumped up before the ball sailed through the uprights. Against the Cowboys, the Seahawks special teams could have singlehandedly won the game and it is a huge relief to know that this very important unit is good enough to significantly alter the outcome of the game. The season is young, but I think the special teams will make much more noise throughout the rest of the season. In Primetime, The 12th Man Never Disappoints: I tip my cap to myself and the rest of the people in attendance on Monday night. Most everybody was in their seats by the time pregame ceremonies rolled around. The scene was really cool with everybody waving their rally towels. The most impressive thing though was that very few people left the stadium after the Seahawks failed to convert on 4th down right after the two-minute warning. Not to criticize Seattle sports fans, but usually at that point in a game most fans usually leave to avoid getting stuck in traffic heading home. Not on Monday night though. I am very happy that everyone around me stayed and we all got to witness one of the most incredible plays not just in Seahawks history but in NFL history. Let’s Talk About The Final Play: Before the Seahawks lined up to run the final play of the game, I looked up one row across the aisle from me. There was a Packers fan who started chanting “S**t Hawks! S**t Hawks!” He had been chanting this throughout the game and of course it made me mad. I started thinking to myself and praying that the behavior by those types of fans is exactly the reason why the Packers do not deserve to win this game. 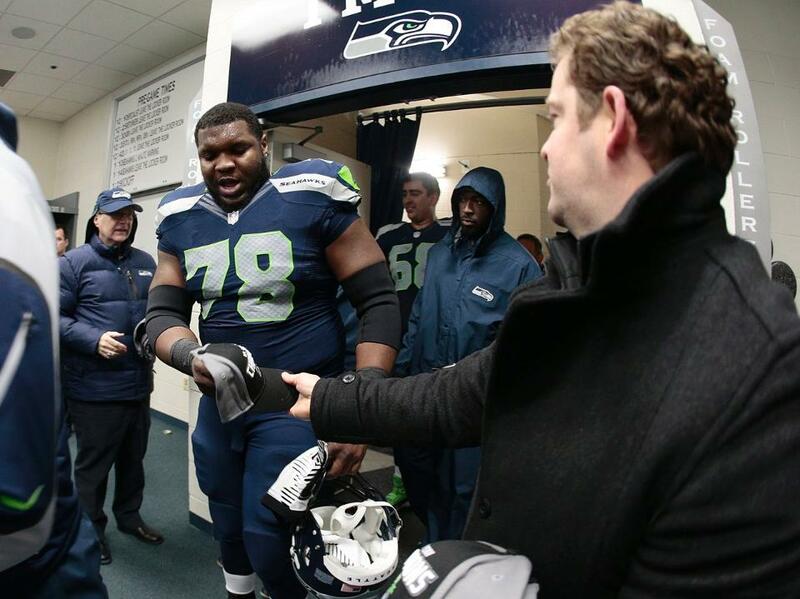 The Seahawks had played lights-out all game long and they played too hard not to win. 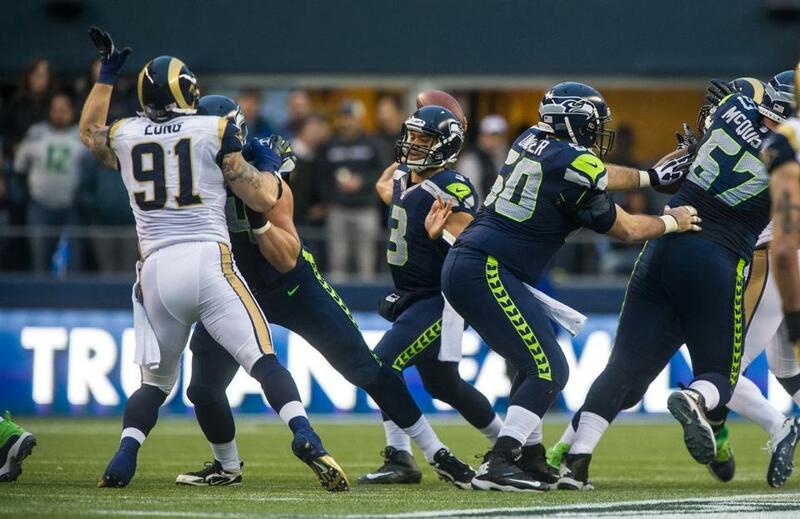 Wilson took the snap and after rolling to the left he planted and fired a Hail Mary to the corner of the end zone. 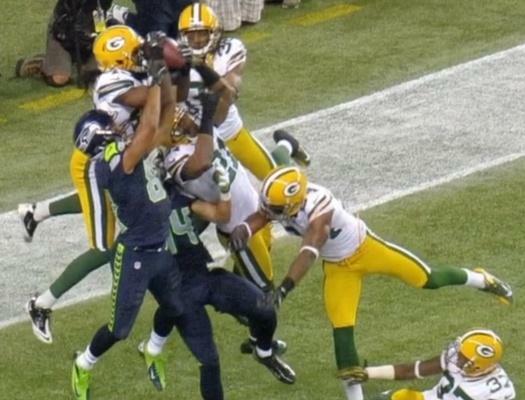 From my view, I thought that Golden Tate had out jumped all 5 Packers defenders and had made the catch. After investigating the scene I saw the side judge call touchdown and I went absolutely crazy. I didn’t even see the back judge call interception and touchback. I was focused on seeing the ref call touchdown. As soon as the side judge did, my eyes were attracted to his arms and the fans around me went into full party and celebration mode. Everyone around me including myself didn’t bother watching the play on the big screen as it was reviewed; we were too happy that we had won the game. When the replacement referee confirmed the call on the field, round two of celebrations in the stands took place. My buddy Elliott and I could not believe what had just happened. As we walked down the aisle to the concourse, I heard people scream “I love Golden Tate!” and “Russell Wilson will NEVER buy a drink in this city ever again!” I then headed back home to re-watch the end of the game. I don’t think Golden Tate caught the ball. I think that the refs clearly missed his offensive pass interference and although the NFL rulebook states that in the event of simultaneous possession the tie goes to the passers, I don’t think there was simultaneous possession in this case. I think M.D. Jennings of the Packers had two hands on the ball initially and Tate only had one hand on it. Upon descent to the ground, Tate was able to sneak in his other hand around the ball to give it the look that both players had their hands on the ball. There is one view I have seen that shows that the officials may have made the right call. Although Jennings had full possession of the ball initially, he had both feet off the ground. Golden Tate had two hands on the ball and both feet on the ground before Jennings did, meaning Tate completed the entire “act of a catch” before Jennings did. Over the last couple of seasons there have been a couple questionable touchdown/non-touchdown calls because the receiver did/did not complete the entire act of a catch. Most notably, a Calvin Johnson reception for the Lions in Chicago against the Bears that did not count because he let go of the ball before getting up off of the ground. In this instance, from this one view it looks like Tate completed the catch and the Seahawks were correctly awarded the touchdown. The response from what happened on Monday night has been unbelievable to me. As a Seahawks fan we have had many games that have come down to close calls go negatively towards us over the years. To have this play go in our favor I honestly had trouble understanding the feeling of the victory. It is incredible to see the national attention we have gotten over the last 48 hours since the last play of the game. We have been the top story on SportsCenter, the Today Show, and even President Barack Obama tweeted his opinion about the outcome of the game. At the end of the day, the Seahawks won and the Packers lost. As great a game as this was and for the memories that will live on forever, it is time to move on, get over it, and focus on our next game. My Opinion Of The Replacement Refs: I’ll keep this brief. After almost three weeks of questionable calls, it was only a matter of time a call made by the replacement officials would determine the outcome of a game. Although the result of Monday night’s game went in our favor, I still believe the job done by the replacements have been utterly ridiculous and it is time for the real referees to return. As of now it looks like the NFL and the NFL Referees Association have agreed on a new contract which will end the lockout. This is ultimately the best case scenario for the league. Random Thoughts: I did not prefunk before the game. We were running a little late and wanted to get into the stadium in time to get a rally towel and to see pregame… The Steve Sabol tribute was really cool to see again. The ovation was really nice and well deserved. Sabol, the president of NFL Films died this past week after a battle with brain cancer. He was 69… It was weird to see Trent Dilfer raise the 12th Man flag. Usually in the flag raiser video the person’s accomplishments are listed. The most memorable accomplishment for Dilfer was his 2003 Steve Largent Award. I loved Dilfer when he was a Seahawk but I personally do not think he has the appropriate accolades to be raising the flag for a regular season game, much less a Monday Night Football game… The offense was introduced and Russell Wilson got the loudest ovation once again. What a thrill that must have been for him… I was asked to sit down by the person behind me for the second straight week. This week it was a Packers fan probably in his late 50’s or early 60’s. Of course I ignored him and he must have dealt with it because he didn’t make a complaint through the rest of the game… Beer is too expensive inside the stadium. Period… There were way too many penalties by the Seahawks this week. That must change going forward. Most of the penalties are discipline penalties that should be easily avoided… There were WAY TOO MANY Packers fans in attendance. Probably worse than the number of Cowboys fans at the home opener… Marshawn Lynch did not score a touchdown, but that did not prevent me from ripping open a king-size bag of Skittles and throwing them at the end of the game when Tate scored the game winning touchdown… The 2005 NFC Championship Game will most likely always be my favorite Seahawks game that I attended, but there is no question this game is the most exciting game I have ever been to. It will probably take another Hail Mary reception at the end of a game to de-thrown this as the most exciting game I have ever been to. I apologize that this review post is a little bit late. I just started my first week of school and have been up to my neck in readings for my classes. This will not stop me from writing my preview post of the game next weekend against the St. Louis Rams. Look for that preview most likely on Saturday afternoon. Thanks for reading everybody. What an incredible game. Go Seahawks!